The following is a guest post by Anna Rud. Anna is a Content Marketer at Serpstat. Establishing an active presence on external resources, developing rich and quality content, implementing of brand strategy and many other are her key responsibilities. Remember those days when keyword stuffing was a real SEO strategy? Well, those days are long gone so let’s be cheerful for that and forget it forever. Since the quality becomes the main value in SEO, we no longer can write articles that are laden with the same keywords and, as a result, readable for the search bots alone. Sure, the article still should contain keywords but, first and foremost, it should be interesting and readable for the real person. I mentioned that keyword stuffing no longer works. Why? You haven’t asked, but I’ll answer anyway: because of Google algorithms’ updates. What are google algorithms then? Let’s figure it all out. Imagine the situation: you’ve typed your query “Halloween hats” into the Google search box. It returns about 37 millions of results. How does it decide what sites to return, and in what order? Who is responsible for this decision? Google algorithms. It’s a gathering of rules that you should follow to take high positions in the SERP. These algorithms are constantly updated, and it’s always kind of talk of the town in the SEO world. Here is an algorithm change history gathered by Moz — the most comprehensive list I know. Anyway, some of these updates turned the game upside down such as Panda and Hummingbird. These two are responsible for LSI. LSI or Latent Semantic Indexing is an indexing method which is capable of identifying patterns between the terms and concepts. Put simply, it can understand the context of the page. Google finds these patterns and understands that words that are used in the same contexts usually have similar meanings. I’ll try to explain it with the examples. Film — film, movie, film 1980, imdb, watch, cast, characters, online, etc. Band — band, jazz, song, album, lyrics, youtube, drive, singer, etc. Microsoft Windows — Microsoft, soft, operating system, Windows 7, download, laptop, PC, etc. House windows — house, home, types, for sale, design, replacement, cost, etc. It means that Google decides what results to show depending on related phrases. 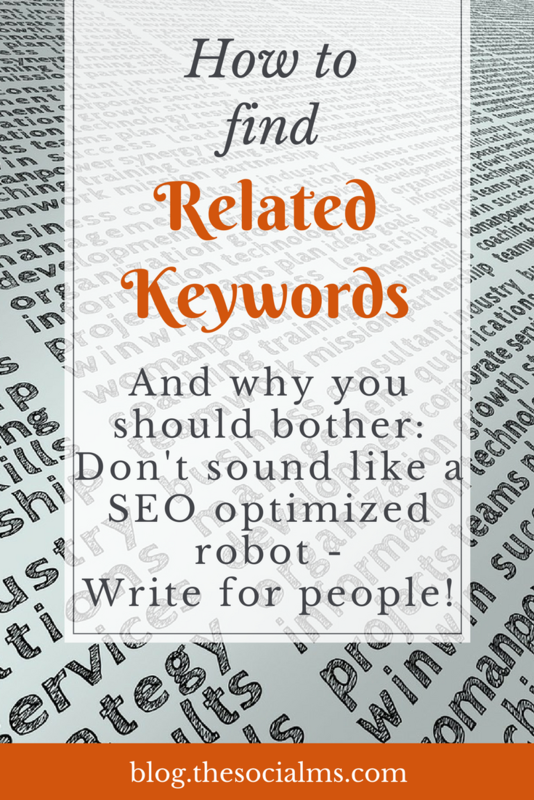 By using relevant semantically related keywords you can tremendously improve your rankings. But the big question remains: How can you find keywords that Google considers related? Which keyword research tools will also provide you with keywords lists that you should consider for your content? Some say that such a strategy simply won’t bring any results, others say that it can even harm your site rankings. But one thing that is clear to me — this text is difficult to read. SEO texts are totally ok as long as you’re not overdoing it. Be sure you won’t get penalized using this strategy. 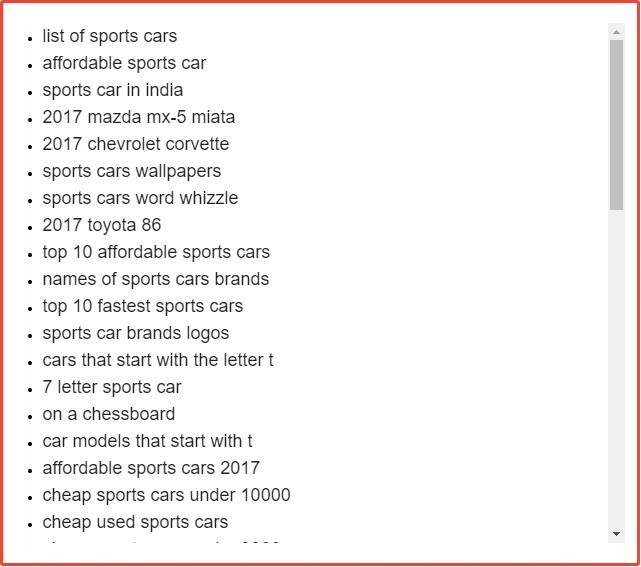 Of course, when you’re writing a text about sports cars, you’ll probably use phrases like sport, car, road, model, speed, automobile, racing, etc. But even so, sometimes simply brainstorming keywords is not enough. We’re lucky enough to have a lot of tools that help to find a lot of LSI keywords in few clicks. 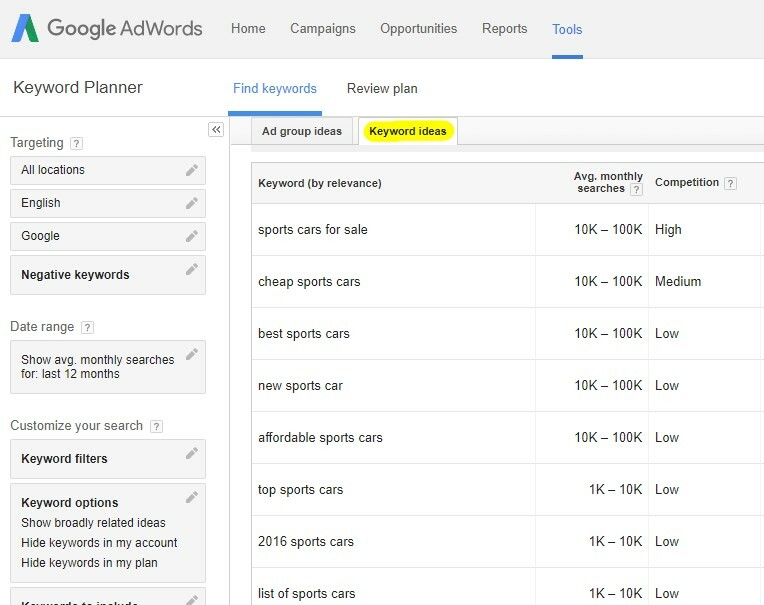 Go to “Keyword ideas” at Keyword planner (Google’s own keyword research tool that you can find within Google AdWords) and check the keyword list if there is something that fits your article. You can see the average monthly searches and keyword competition. The last metric is quite important as sometimes too competitive keywords aren’t worth efforts. Mix high competitive keywords with middle and low ones. The Related Keywords feature returns a list of all keywords semantically related to the researched query. It means that there are at least two identical pages in top 20 search results for the researched query and its related keyword. You can export all of the keyword suggestions to Exel or Google spreadsheets, analyze and then naturally insert some of the phrases from the keyword list into your post. This keyword tool is designed precisely to gather LSI keywords, so it’s the simplest tool with only one feature. Just type your primary keyword into the search box and get a bunch of new keywords for your content. This tool finds a lot of LSI keywords and searches questions. The results are sorted by prepositions, questions, comparisons, and alphabet. It also paints exciting reports with great visualization. write so that LSI keywords look naturally and try not to overdo it. That’s it! It’s just another way to improve your content and rank higher through the simple use of related keywords. Try it, watch your search engine rankings and draw your own conclusions. There is even one more aspect to optimizing your content with related keywords: Sometimes we do not quite know for which keyword searches people will be looking when they should find our content. We can only make an (educated) guess. This guess can be based on research with the aid of keyword tools. Using related keywords in the content will not only increase the keyword density without annoying your audience with repetitive keyword mentions. I will also give you a much bigger chance of actually using the keywords or keyword phrases and search terms your audience searches for. You may notice in your Google search console, that some of your articles may not rank for the search terms you optimized them for. Sometimes your content may even rank for related keywords and long tail keywords even if you never mentioned these keywords in your content. Adding these keywords to the content can tremendously improve rankings AND click through rates! 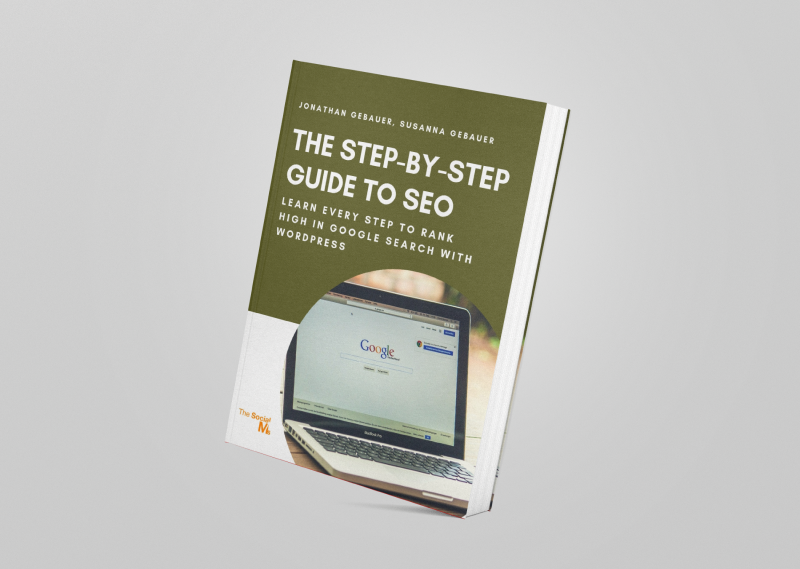 Are you struggling with your SEO? And search traffic is not coming to your blog as it should? Are you dreaming of getting awesome traffic from Search Engines to your blog? Are you stuck with your SEO efforts? Do you need help with setting up your Blog for SEO? We guide you through the setup of plugins, tools, and processes to get everything right for awesome traffic from Google search.